In the professional services business in which I work, we have a term called "scope". It basically is used to refer to what work falls under a contract, and what doesn't, or what we're doing on a project, and what we're NOT doing on a project. A recent thread on TheRailwire got me thinking about how different many modelers are. The old notion of "we each enjoy our trains differently, and that's ok" is often brought out whenever there's an ideological disagreement on various forums to extinguish flame wars. This notion is an important one in the hobby, allowing "daisy pickers" to coexist along side "rivet counters" without igniting feuds. However, I've realized that there's something else at work here. Aside from how seriously modelers take all this stuff, there is also a spectrum of what type of "serious" modeler people are. It's very possible to be serious about building a model of "a railroad". For years, Tony Koester championed this from the pages of RMC and Model Railroader. His Allegheny Midland was a wonderful model of a railroad (even though it was freelanced). He modeled the way a railroad works, but the rolling stock and structures were important in as much as they supported the model of the railroad itself. Structures should all be roughly uniform, as that's how a real railroad does things. Locomotives and rolling stock should all be accurate in as much as they represent an accurate "fleet". While Tony had many outstanding individual models, I believe that they still existed mostly to support "the railroad". In this mindset, the individual "work" is the layout itself and the railroad system that it represents. On the other hand, it's very possible for a modeler to be very serious about building individual models. NMRA contest rooms are full of these models, and while some may exist in the context of a larger modeling endeavor, many were built to stand on their own as outstanding individual works. They may end up being part of a layout, but in this case, the layout serves as a place for these individual models. Howard Zane's outstanding layout, I believe, falls into this category. Howard has a basement (plus) of very well done models, of both rolling stock and structures, however, Howard's layout "functions" to serve as a display place for these models. In this view, the "work" is the individual models, and the supporting items (like track, for example) are not the focus of the modeling. These schools of thought are not always conscious decisions, but often seem to stem from the smaller micro-decisions of what's "good enough" that take place in all model railroaders minds. For some "good enough" means that the mix of cars in a train are correct, even if they're riding on Kato's JDM spec Unitrack, while others won't care if the cars are of mixed eras, as long as they all have full brake rigging, while even others only care if they're all weathered, but look "wrong" unless they're all rolling along on hand laid code 25 rail with tie plates and joint bars. Either of the mindsets can be representative of people who take their modeling seriously (like I do), and I believe there is a mutual respect between people in both camps, but I believe that the more people acknowledge the existence of these camps, and the many modelers who try and straddle them both, the better and happier we will all be (mostly because it will spell the end of the "you're not a real modeler if you don't..." threads on forums). I've found that the "it's my layout, I'll do what I want" statement is often a knee-jerk defensive reaction to criticism rather than a recognition of differing hobby styles. Granted, much of the time it's a response to unconstructive criticism, but it's occasionally used as a block to prevent any suggestions for improvement, no matter how constructive. I don't think anybody is questioning the right of a model railroader to choose Unitrack over handlaid or to pull autoracks with a Big Boy. The real question is whether we wish to stay in one camp for good. Some do, some don't. But when offered constructive advice that we wish not to take, it's probably best to say that we've "considered that, but have decided against it for dumpty-dump reason," so that we can defend our camp. The defensive "I do what I want" sounds like the hobbyist has made uniformed and ill-considered decisions and doesn't wish to learn from the collective experience of others. This post insightfully and persuasively posits two fundamental styles in model railroading which could be termed "macrocosmic" or "holistic" in scope (all the various components are justified only to the extent that they contribute to what John Armstrong would call the "railroadiness" of the entire layout) vs. "microcosmic scope" (the layout is justified to the extent that it provides the context in which the modeling excellence of individual components can be highlighted). This distinction contrasts in interesting ways with a distinction originally drawn (I believe) by David Barrow between representational vs. realistic model railroads; the point of reference for this distinction isn't "railroadiness" but "prototypicality." A representational railroad doesn't try to duplicate prototypical scenes, buildings, rolling stock, etc., but instead tries to convey the "look and feel" or "gestalt" of the road and era being modeled; in contrast, a realistic railroad tries to duplicate, insofar as possible (e.g., via compression, suggestion, or outright trickery) documented prototypical features. I find these terms useful to think about my own modeling commitments, which I would describe as simultaneously macroscopic and realistic. I want to convey railroadiness without worrying too much about achieving modeling excellence with each and every component, while at the same time the components need to be strike the viewer as reasonably "realistic" (i.e., prototypical) -- even if the components are not, individually, modeling masterpieces. Ultimately, my goal is that anyone who had spent some time watching trains in or near Price Canyon would, when viewing my layout, experience a "shock of recognition." I thought about this quite a bit this afternoon watching four of my IM SD40T-2s hauling 35 (empty!) quad hoppers up the 2% eastbound grade of my N-scale Utah Division's Gilluly Loops. I use -- horrors -- Unitrack, albeit painted and ballasted Unitrack, in part because I have limited time available for modeling and want to develop a relatively large, operating layout with completed scenery within a year or two. But the main reason is that I believe that Unitrack's deficiencies from the microcosmic point of view are largely irrelevant to my twin goals of macrocosmic scope & realism. For example, my track plan is based on extensive research and, apart from necessary compromises, duplicates the documented layouts of the yards at Helper, Soldier Summit, Thistle (ca. 1965), as well as the main line that connects them. In addition, I've learned how to hack Unitrack in numerous ways, including creating beautiful-looking easements (R718+R481+R384+R481+R781),laying out perfectly aligned triple-track curves by exploiting the latitude in R481 Unijoiners, and even creating code 55 Unitrack for sidings and yards. (It's easy, actually.) But most importantly, my trackwork is laid on a foundation that duplicates documented Rio Grande and contemporaneous track engineering standards, including subsurface grading and drainage. Ultimately, I would argue that my (hacked) Unitrack, although it violates microcosmic norms right and left (tie spacing, etc. ), can actually be MORE realistic in its total effect than code 55 flextrack that is laid without any regard for prototypical grading practices, drainage, track plans, etc., as it so commonly is. Thanks for this great post (and, equally, Dave Vollmer's comment), which got me thinking about my objectives in a disciplined and (for me, at least) enlightening way. And I can only echo Dave's comments that the more carefully we consider the tradeoffs we've made, the more likely we'll appreciate those made by others. And who knows? Perhaps I'll change. A fantasy layout of mine would be an entirely microscopic yet representational HOn3 D&RGW narrow gauge layout...! Great ideas, I always enjoy reading this site. I really enjoy your comments. I'm finding I'm enjoying them as much as I did writing the piece. I'm going to reply to each of them in their own comment, since the comment box is so tiny, and I want to give them each lots of thought. I agree with your comment about the knee-jerk responses. For some reason, I've found modelers to be very defensive when it comes to criticism. I think it may have something to do with the low level of public acceptance of our hobby, but I DO know it's something I think I'm going to explore further. Thanks for that. Your layout actually has given me some real food for thought. The recent thread where you got all the praise for your video really drove a point home. You have created a real masterpiece in a small space. That, I believe, does a very good job of capturing something almost larger than life (the PRR middle division) in a small way. You may not have the four track broad way (and people think the train was named for the street in The City...), but the style of your main does a VERY good job of faking it. I'm not usually a fan of selective compression, but I think you've really pulled it off. You also make a good point about the "model railroader progression". I don't know if there is such a thing though. I think that people come to this hobby from a number of directions, and I don't think there's neccessarilly a linear path from "figure eight on a four by eight" to Ken McCory's Buffalo Line. I think, more of what happens, is that there are different overlapping types of interest in trains, and that what people do with their modeling is just an expression of that. For example, I have a friend who's just "into trains". He's fascinated by the art of what we can do, and what's created, in N scale. He's quite talented at scratch building, but tells me to piss off when I bring up "well, what did the prototype do?". Not because he doesn't think it's a valid point, but because he's enjoying his creative process. In this regard, modeling is a medium for his creative talent. He's actually had a lot of influence on my thinking, and is the reason why I built myself a door layout. I'm glad he did, I'm really enjoying it. He's gotten me to loosen up a lot about trains, and that's definitely a good thing. I hate to trot myself out as an example, but in this case, I think I am one. I don't enjoy doing most of the minutia of modeling (isn't THAT strange?). Things like converting couplers, installing decoders, and doing electical work, all bore me, and I try to avoid them whenever I can. However, I will put time into things that are visual, which I guess means that I'm more concerned about the appearance of my models than their function, but that's not entirely true. I feel that I'm actually very interested in their overall function. 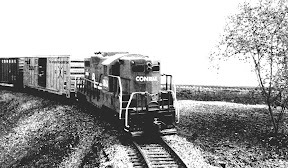 I want a Conrail SD40-2 (well, actually, a bunch of them). Not because it's an interesting model, but because they were a mainstay of CR's mainline fleet, showing up most everywhere. They're kinda the "baseline" engine, as it were. Not having them is a major gap in my roster. And while I enjoy smaller, second hand stuff more, in order to model the "meta" of Conrail, I need a few. And if I'm going to have some, they have to be at least close, to keep up their "Conrailiness". For example, I know that they had one style of grills (corrugated, vs chicken wire), and 88" noses (as opposed to 81" ones). These details are important to me because they signify when the locomotives were purchased (post 1976). They also have to have Flexicoil trucks instead of the stock HTC ones (because these were distinct Conrail-only features). I'll put the time into making these details right, but I had BETTER be able to just drop a decoder in it, because I sure don't want to fight with cutting into the metal frame or picking up my soldering iron. In this example, my level of electrical gizmology is really low, however, I feel my level of spotting-feature smack-fu is rather high. I DO however, think there is a progression of knowledge once someone becomes interested in something. But this only happens after there's a desire to learn about something. The whole NMRA "Master Model Railroader" thing is a good example of this. While I believe the name may be a bit of a misnomer, it does represent a very graphic example of the scratch building procession. I think that if we really want a better representation of what a modeler is all about, we need to look at the combination of all of the various (infinite, it might seem) areas of interest in the hobby and their progression on all of them. But then again, this begs the question "why?". But that's probably going to be another post some time.